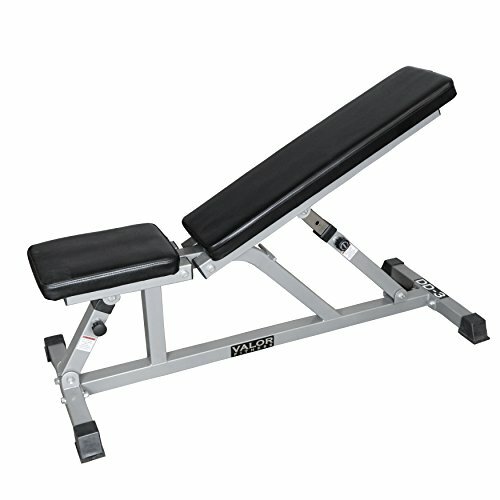 The DD-3 Valor Athletics Incline/Flat Utility Bench offers a variety of options for each user. Solid steel padding supports give user a safe secure workout. Quick easy to use pop-pin lock adjustments make changing the angle of the back and seat pad quick and easy. Perfect for use with Smith machines, Power Racks or by itself as a dumbbell utility bench. Features: Steel frame measuring: 2" X 2". High density, dual-layer back pad measuring 34.75" x 10" x 2". 4 position, high density, dual-layer seat pad measuring 14.5" x 10" x 2". 5 incline positions as well as flat position. 6 position, high density, dual-layer back pad measuring 34.75" x 10" x 2". Floor to top of pad in flat position 17.75". 4 position, high density, dual-layer Seat Pad measuring 14.5" x 10" x 2". Back pad adjusts from 0 (flat) to 70 degrees and seat adjusts from 0 (flat) to 60 degrees, both use locking popper pin for adjustments. Max load rating: 500 lbs (flat) / 650 lbs at 20 degree incline. Warranty: 3 Years Frame. 2 Years Pad. 1 Year Popper Pins. Assembly Required.